MRW60 BIG HORN 3 BLAST, MRW61 BIG HORN 2 BLAST, MRW62 MEDIUM HORN 1 BLAST,MRW63 STEAM WHISTLE 1 TOOT, MRW64 STEAM WHISTLE 7 TOOTS, MRW65 WHOOP WHOOP, MRW66 CLYDE PUFFER. 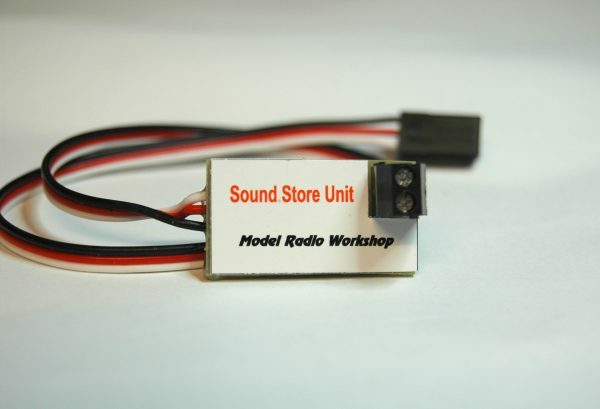 They can also be supplied with a recording that you have made with a maximum length of 16 second, just send the MP3 file of your recording to Modelradioworkshop. MRW60 Big horn 3 blast. Plug the sound unit into any spare channel on your receiver. Now wire up a loudspeaker of your choice to the terminal block provided, which must be no lower than 8 Ohms. First if you are using a computer radio make sure the end point/travel is set to 100% on the channel you are going to use to operate the sound unit with, otherwise you not be able to trigger the sound store unit. The sound unit is designed to operate when the channel it’s operated on goes below 1.35ms and will then play the sound once and stop. In the case of a switched channel and a knob channel you will have to return it to the 2.0ms end and back again to make it play the sound once more. When using a spring return stick channel just let the stick return to centre, you may need to adjust your trim on this channel to get the sound unit reset every time. To get the best sound from your loudspeaker the use of cardboard tubes to enrich the sound (see diagram below) and increase the bass or you could make a box to achieve similar improvement. Please note the unit is not waterproof, so you must protect it.